If you loved the original Action Ball, then you will go wild over Action Ball Deluxe ! 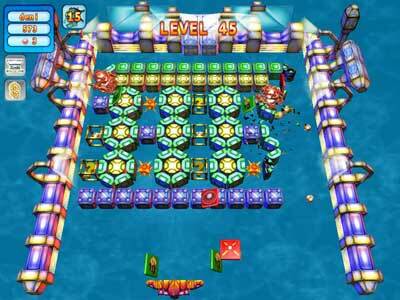 Bigger, better and even more fun, Action Ball Deluxe will satisfy your cravings for brick-busting action with three new bosses, four new bonuses and an all-new 110 level campaign. Like before, you will face a legion of robots that will do their best to foil your efforts to obliterate every block. A supply of special weapons and bonuses not seen in other Breakout games are on hand to turn the tide of battle in your favor, however, including a dazzling multi-missile attack that destroys every robot on the screen. Rounding out this outstanding package are superb 3D graphics and sound effects that beg to be played loud.